Surprise! I'm pregnant! With Twins! We found out that I was pregnant this summer. 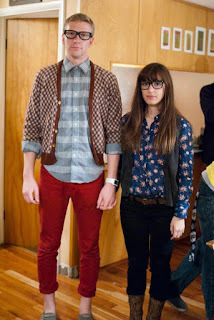 We had been trying for kind of a long time, so we were super excited just to be pregnant. As far as pregnancy symptoms go I've had it pretty easy. There were a few weeks where I felt a little nauseous and I have been ridiculously tired for a solid month, but for the most part I've been feeling pretty good. 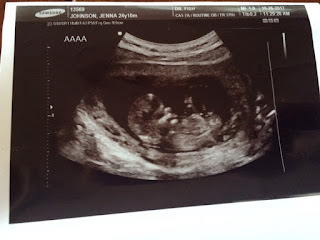 I had my first ultrasound this past week. We went to the office and talked with the tech. She was the same one we had last year when we had a miscarriage, so she was happy to see us again. The tech started waving the wand around on my stomach and then she said, "So last year there was no heart beat, but this time there are TWO!" I about fell off the table. I recently acquired the Kitchen Aid pasta maker, and I was really really excited about trying it out. I have been having visions all afternoon of all the homemade pasta I would make, and how I could package it in cute wrapping to give to my neighbors for Christmas. Turns out, making pasta dough is kinda tricky. I used the recipe that came in the booklet with the attachments, and the dough kept turning out crumbly. So then I would add water and knead it more, and turned it into this disgusting pile of dry dough with a slimy outside. After starting over and trying again, and then failing again, I tried a different recipe from a blog on Pinterest. 3rd times a charm. The part where you flatten the dough and then run it through the cutter was pretty easy. The noodles ended up a really nice thickness (as in not too thick, which I have heard is common). Btw, Clayton was my sous chef during this part of the process. It was fun! I love summer. It's my favorite season. This year has absolutely flown by. We're busy, busy, busy all the time with trips, friends, family, work, and Abe. I threw a few photos up on here to commemorate some of the moments left on my phone's camera roll before I delete them. This was at the beginning of summer. Hannah flew to Ohio to visit Nana and Abba, and we drove down to see her. We played at an Escape Room, which was awesome. 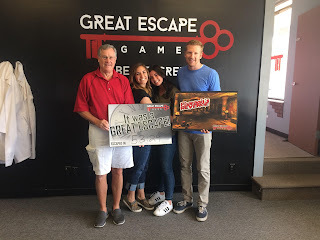 We had played one game before and failed, but this time we actually succeeded and escaped! Our theme was the Pharaoh's tomb, which included so many hieroglyphics and I don't think a single one of them ended up being a clue. Dani had her 30th birthday, and we celebrated with a dance party in Utah. It was a fun reason to get dressed up and see everyone. Tatum got baptized (also in Utah, of course). Without meaning to, all of us siblings ended up matching with floral prints. I guess floral is very in right now.